THE STREETS of Damascus were packed on Wednesday to give Venezuelan president Hugo Chavez a hero’s welcome on his arrival for top-level talks with the Syrian President Bashar al Assad. Huge crowds from all walks of life waved banners and flags of the two countries and portraits of the two leaders as the motorcade drove through the city to the hill-top People’s Palace for a 21-gun salute and the first round of talks with the Syrian leadership. The revolutionary Venezuelan leader is well known on the Arab street for his defiance of American imperialism and his support for the Palestinian Arabs and the heroic Lebanese resistance that defeated Israel in the border war last month. Chavez denounced American imperialism’s support of Israel and condemned Israel’s aggression and its war-crimes, which he likened to those of the Nazis. 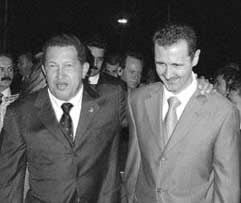 During that war, when Blair and Bush were blocking a ceasefire at the UN because they still hoped Israel would win, the Syrian communist party called on Arab governments to copy Venezuela. Ammar Bakdash, a member of parliament and of the party’s politburo, said: “We call on Arab leaders to follow the example of Venezuela’s President Hugo Chavez”, who recalled his ambassador from Israel while accusing the United States of blocking UN Security Council action to stop the conflict. Egypt and Jordan are the only Arab states which have diplomatic relations with the Zionist entity. The Communist Party of Syria is part of Syria’s National Progressive Front, which is led by the governing Arab Socialist Renaissance [Baath] Party. Chavez, who has just completed successful talks in People’s China and Malaysia, landed in Damascus Tuesday evening. Bashar al Assad greeted him at the airport and thanked him for his “great stand” in support of the Arabs. “We appreciate your sincere feelings toward the peoples who have their rights and are under occupation, as well as your sincere humanitarian and moral sentiments,” Assad declared. “We have the same political vision and we will resist together the American imperialist aggression,” Chavez replied adding that the two countries will sign a document opposing US “aggression” in the Middle East. Last month, Chavez visited Iran and received the country’s highest state medal for supporting Tehran in its nuclear standoff with the international community. Iranian President Mahmoud Ahmadinejad called the South American leader “a brother and trench mate”. The badge of honour was granted to the Venezuelan president to honour his valuable and brave efforts to establish a justice-based peace, adopt a stance against the hegemonic system and support endeavours to uphold the freedom and independence of Venezuela. Chavez’s struggle to end the corrupt and unequal political and social system in Venezuela; his support for Iran’s stance on the nuclear issue, particularly Venezuela’s vote against an anti-Iranian resolution adopted by the International Atomic Energy Agency (IAEA), and his support for popular moves in Latin America and efforts to eradicate poverty in the region were the main reasons Iran made the award. The former Venezuelan paratroop colonel has built close ties with Iran, Syria and other Middle East countries following the triumph of his Revolutionary Bolivarian Movement in the 1998 elections. Venezuela is the fourth largest oil producer in the world, and Chavez is using his country’s wealth to help the masses and assist other countries in South America and beyond, which are striving to develop their own independent economies outside Anglo-American imperialism’s “globalisation” frame-work. Chavez’s world tour – he’s going to Angola next – has broken imperialist attempts to isolate his country and strengthened Venezuela’s bid for a place on the UN Security Council. People’s China and Malaysia are both backing the bid for one of the rotating seats traditionally reserved for South America. US imperialism wants Guatemala to replace Argentina, which stands down in October. “The US government has employed every means to block my country from joining the Security Council,” Chavez told reporters when he was in Beijing last week. “The American imperialists are trying to stop us”. The decision will be made by all the South American and Caribbean countries and if they can’t agree the choice will go to the full UN General Assembly. AGE CONCERN last week released a shocking report, Hungry to be heard, revealing that 60 per cent of elderly hospital patients are at risk of malnutrition because nurses do not have enough time to help them to eat the dinners that are put in front of them. Many patients who are malnourished on arrival in hospital get a lot worse during their stay. The report also said that 90 per cent of nurses say they do not always have time to assist patients who need help to eat. The logical deduction is that there are not nearly enough nurses. Everyone in the NHS knows full well that diet is a vital part of recovery from illness and injury. Yet NHS trusts are cutting nursing jobs because they cannot balance their books. They make these cuts in the full knowledge that this will make the shortage of nursing care on the wards even worse. The NHS trusts cannot balance their budgets because of the swingeing costs of the private finance initiative contracts, which have proved a real seam of vast riches for City finance companies. The insatiable greed of these fat cats is literally causing starvation among the elderly. Yet if we said these bloated capitalists are grinding the faces of the poor in the dirt, we would be accused of using quaint and old fashioned language, of exaggerating and being melodramatic. It is not just the elderly who suffer from a desperate lack of time and attention and are treated by capitalism as though they are worthless and a burden. Recently Guardian columnist Julie Bindel complained that people like her, who had chosen to be “child-free” should not be penalised by school holidays and being forced to share public places – like trains, restaurants, art galleries and museums – with children on holiday. Clearly she believes their parents should keep them permanently out of the way, in schools, at home or locked safely away in cupboards. Or better still, people in Britain should not have children because, it seems, capitalist society has no time or desire for children. Taking care of children properly takes time – and time is money. Their parents would be more useful making profits instead of babies. And when a new generation of workers is needed, we can import them from Poland or Nigeria or Bangladesh or almost anywhere else. The capitalist worship of money has always cheapened the value of human life – especially working class human beings – from the days of the industrial revolution when wage slaves were recruited in childhood, worked until their health was wrecked and then discarded right up to today. It tries to abolish the collective, social human traits – the innate mutual caring instincts that allowed the human race to survive and prosper. On the anniversary of the hurricane Katrina we are reminded of what happens to a human society where the ruling class, in its drive to maximise greed, selfishness and profit, has almost totally suppressed collectivism and tried to dissolve society. Funding to maintain the levees that protected the city was cut in spite of meteorological predictions of the disaster that happened. When the storm approached, people were told to rescue themselves; the poor, the sick and the elderly were left to sink or swim as best they could. The official death toll was around 1,900 but many suspect it was far higher. When the authorities belatedly returned to the drowned city, they were more concerned to shoot the hungry and desperate survivors who had robbed flooded shops for food and bottled water than to rescue or feed them. The flood damaged goods in the wrecked shops were valued more highly than the lives of the people. The values of capitalism lead to a nightmare society where people are devalued and despised while wealth and riches are everything. It’s little wonder there is so much depression and mental anguish. But mental anguish alone won’t change things; we need something more constructive. What we need is anger – good healthy collective, united working class anger; the same anger that drove Marx, Engels, Lenin, Stalin, Mao and Kim Il Sung. We need people who are prepared to organise, unite and fight, by whatever means are appropriate, to banish capitalism and its values to history and to replace it with human, caring socialist values.